The Indian Markets continued to consolidate for the second day as the Wednesday’s session a range bound trade. The benchmark Index NIFTY50 opened flat, slipped lower but recovered in the second half of the session to end the day with nominal loss of just 4.80 points or 0.05%. The consolidation continued to reflect underlying strength as the session continued to pile some more Open Interest in the derivative segment. We may see this consolidation persisting for some time. Thursday’s session may see a quiet to modestly positive opening and we may see the session continuing to witness stock-specific out-performances with limited downsides. Thursday is likely to witness 10655 and 10690 as immediate resistance area. Supports are expected to come in at 10590 and 10550 levels. 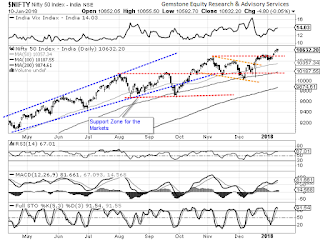 The Relative Strength Index on the Daily Chart is 67.0054 and it remains neutral showing no divergences against the price. The Daily MACD stays bullish as it continues to trade above its signal line. A black body occurred on Candles. However, this remains insignificant when read in the present situation. The pattern analysis shows a NIFTY attempting and achieving a clean break out as it moved past the 10490-mark. It has been consolidating since last two sessions. It would be important to see if the NIFTY consolidates in a narrow range or suffers a minor throwback before it continues with its up move. All and all, the current structure of the Charts read along with the F&O data continue to portray a favorable picture for the Markets before a run-up to the union budget. 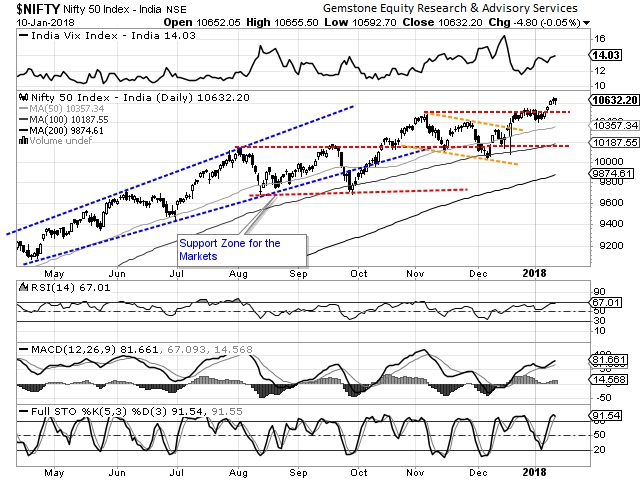 The NIFTY has achieved a breakout and is likely to continue with its up move in the immediate near term. However, the only thing that needs to be sees is that the NIFTY consolidates in a narrow range or suffers a minor corrective throw back before resuming its up move. While we are in this formation, we recommend continuing to make select purchases and maintaining a cautious positive outlook on the Markets.